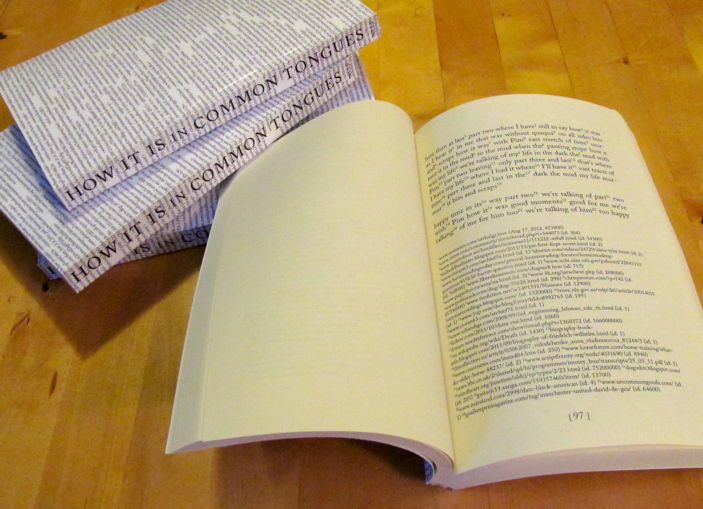 How It Is in Common Tongues was composed by searching for the text of Samuel Beckett's How It Is using a universally accessible search engine, attempting to find, in sequence, the longest common phrases from How It Is that were composed by writers or writing machines other than Beckett. These phrases are quoted from a portion of the commons of language that happens to have been indexed by a well-known service. The notes at the bottom of each page in the book give the shortest url (often one of many) that we were able to retrieve for the phrases cited. The first in a sequence of citations provides, in parentheses, the date when we found the phrase on the web page given, and immediately subsequent citations will have 'id.' instead of a date, where this is the same as that last provided. The number following the date (or 'id.') is the total number of occurrences found for the phrase, as searched on that date and for the search engine we used. Note numbers are hexadecimal.